I am a clean boy. Honestly guys, what the hell. I can’t even post something about bugs coming out of my hair, or you guys are already all over me. YOU ARE A DIRTY BOY. YOU NEED TO TAKE A SHOWER. Like hell I’ll take a shower. The last time I showered was less than 24 hours ago, so I should be fine. “It’s a gypsy moth caterpillar I think. SEE. NOTHING IS WRONG WITH MY HAIR. It was a hot windy day, so she probably came falling from a tree. 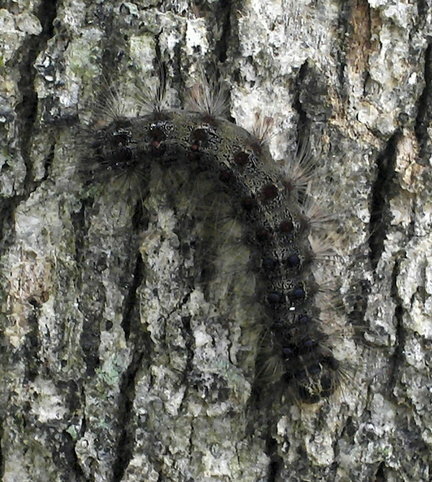 hairy caterpillars are extremely itchy when they come in contact with your skin. i’ve heard stories about them falling on people all the time. Meh, I don’t even play my Wii. Also, if that thing is a pet, you’re weird. But I still love it. That’s awesome. lol. I freak out whenever something crawls up my hair. I believe these ‘needles’ are soft .. almost like a fur. I never seen a caterpillar like that before. hope she’ll grow big and strong. then you could walk her like you would walk a normal pet, like a dog.